Venezuelan Army Colonel Ruben Paz Jimenez has stated in a message that spread on social networks, that he recognises Juan Guaido as the president in charge, adding that "90 percent of the armed forces are in discontent" with Nicolas Maduro, the media reported. The colonel has also asked the military to allow the entry of humanitarian aid to Venezuela. 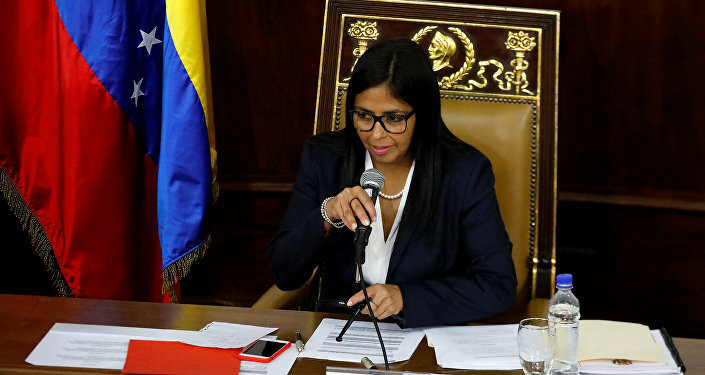 The statement comes after General Francisco Esteban Yanez Rodriguez decided to switch sides and recognise Guaido; his betrayal was strongly condemned by the Venezuelan military. Earlier in February, it was reported that the Venezuelan military had blocked access to a bridge uniting Cucuta, Colombia and the Venezuelan city of Urena in order to prevent possible deliveries of humanitarian aid from the US. The Venezuelan government insists that the country isn't experiencing a humanitarian crisis. Venezuelan President Nicolas Maduro holds Washington responsible for staging a state coup in the country, and has slammed US assistance as a "political show". Late last month, the military attache of the Venezuelan embassy in Washington, National Guard Colonel Jose Luis Silva, also ignored Maduro and called on the military to restore democracy in Venezuela. On 23 January, Juan Guaido, the head of the Venezuelan opposition-led National Assembly, proclaimed himself the country's interim president and was immediately recognised by the United States, Canada, Brazil, Colombia and other US allies. Russia, Mexico, China, Turkey, Uruguay and several other countries have come forward to reaffirm their support for Venezuelan President Maduro as the country's only legitimate democratically-elected head of state.